At Hands 4 Zero Poverty (H4ZP) we understand the importance of early child development. This is one major reasons 35 percent of the donations, acquired through our campaigns, are invested towards promoting education; supporting existing educational programs, creating new educational opportunities, etc. Education is a core value to Hands 4 Zero Poverty. Education is a key tool for pulling people out of poverty. 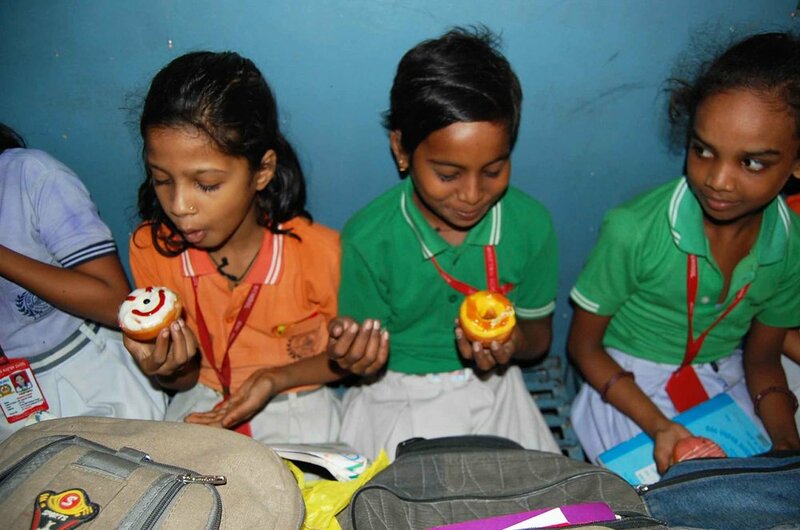 With extra funds from donations, the children attending Rajeev Nagar school school were able to enjoy their very first doughnut experience (i.e. treat experience). The children attending Rajeev Nagar school in the slums of Faridabad came first in mastering English in the region. Hands 4 Zero Poverty had the privilege to help in this quest for success thanks for the support of all the donors. Rajeev Nagar school is mainly funded by donors from all over the world. The school provides free education opportunity to children who are not attending public school. In many areas in India, capacity in public schools is limited. This means, many children are left with no access to free education. Help promote education in the slums of India. Education is a key tool in providing a sustainable solution to pull communities out of poverty. By educating an entire population, economic growth is a natural effect. Studies show that each extra year of schooling can increase a person’s salary by 10 percent later in life.